The Solar Ultraviolet Spectral Irradiance Monitor (SUSIM) Level 3BS data product consists of daily, 1 nm resolution, solar spectral irradiances and selected solar parameters. The instrument consisted of two identical double-dispersion scanning spectrometers, seven detectors (5 photodiodes, 2 photon counters), and solar ultraviolet calibration sources measuring in the wavelength range from 110 to 410 nm. One spectrometer measured the solar disk while the other was for calibration using high-precision deuterium lamps calibrated by NIST. 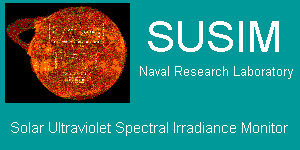 SUSIM was flown on NASA's Upper Atmosphere Research Satellite (UARS) and designed to measure the full disk solar irradiance with high precision and accuracy to follow short-term (minutes to hours), intermediate-term (days to weeks), and long-term (11 year sunspot, and 22 year solar magnetic field cycles) variations in the solar output. The SUSIM Level 3BS data were processed with the version 22 algorithm. The SUSIM Level 3BS data consists of 1 granule per day. The data are normalized to an earth-sun distance of 1 AU, and instrument degradation have been applied to the data. Included with the primary solar spectral irradiance values are the following solar indices: Lyman alpha, O-I (130 nm), C-II (134 nm) and C-IV (155 nm), Al Edge, and core-wing ratios of Mg-I and Mg-II. The data files are available in a binary record oriented format. Created by: Brueckner, Guenter E., et al.